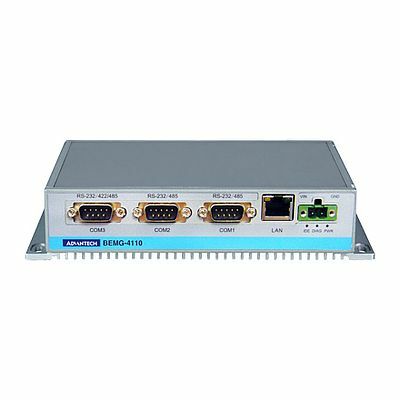 Advantech's BEMG-4110 is a fanless Energy Data Concentrator featuring an AMD Geode LX800 500MHz and rich interfaces (such as serial, USB and LAN). Installed with Advantech WinCE WebAccess, BEMG-4110 is a browser-based Energy Data Concentrator, whose Web Server function increases flexibility and convenience, making it easy to configure and maintain the system via Internet. With built-in driver, BEMG-4110 can connect with a variety of automation equipment and devices, and get data from them. 2 x RS-232/485, 2 x RS-232/422/485 with automatic flow control. The main features of this product include: 1 x 10/100Base-T RJ-45 port and 2 x USB 2.0 ports; fanless design with no internal cabling; built-in Windows® CE with Advantech WinCE WebAccess Energy Data Concentrator; supports various protocol drivers to communicate with different devices; multi-thread communication, fast response time; configured through web browser; easy to diagnose and maintain, which helps to reduce maintenance costs.